Well hello! I took a few days off while on a trip with my husband, but I'm back with some friends for a fun challenge today! 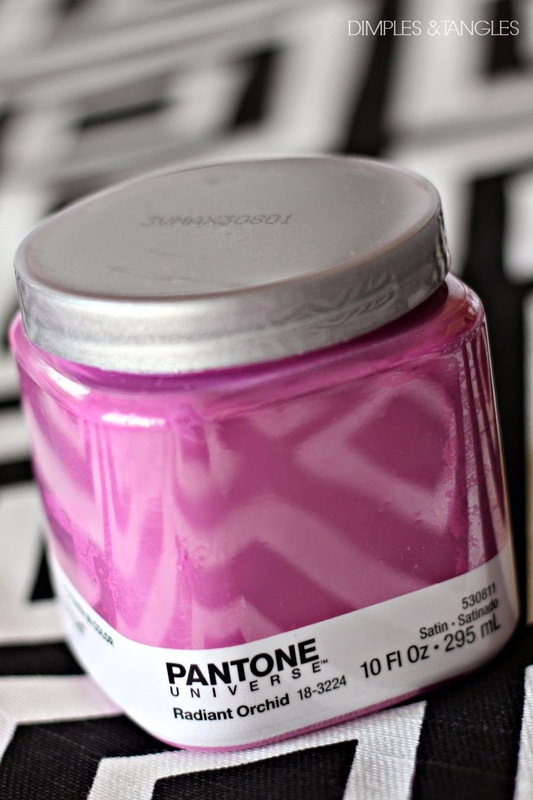 As you probably know, Pantone has chosen "Radiant Orchid" as the color of the year. 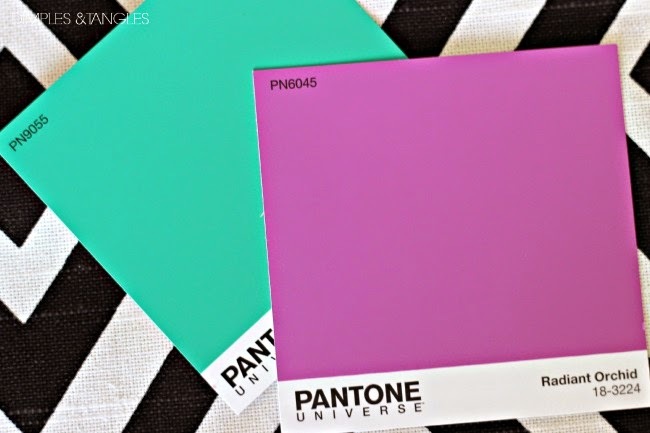 Honestly, before I started reading home blogs, I never knew there WAS a color of the year. Last year I got lucky, as it was Emerald Green. That one was easy for me! This year, not so much. Radiant Orchid is somewhere between hot pink and purple. Pretty on it's own, but not super easy to work into decor. Brilliant, right?!? I know, not super original but I DO think it's a fun color for Spring. I'm sure we all agree it's time for a burst of color after such a dreary winter! Not being able to let the Radiant Orchid stand alone, I just had to add some black and white in with it. With some ribbon from Hobby Lobby and hot glue, I was finished in about 5 minutes. With the tapered shape of the pot, it really worked better to have the stripes running vertically rather than horizontally. A bit of pom pom fringe added some whimsy to one of the pots. 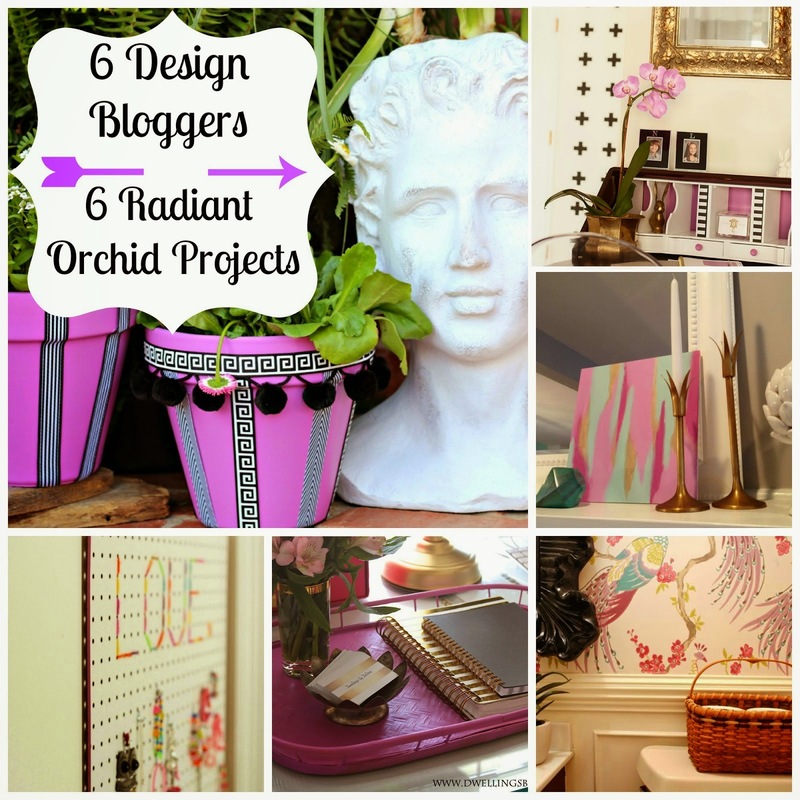 If you want to try your own Radiant Orchid project, Lowe's has readily available sample pots for around $4. 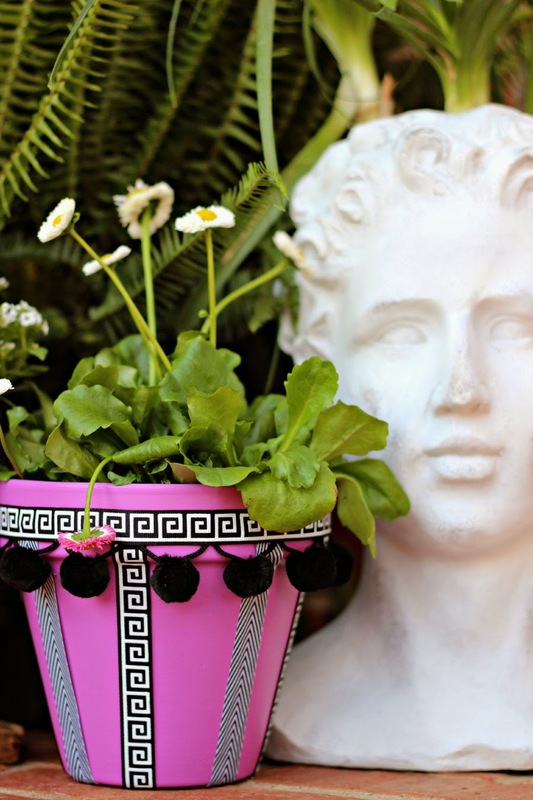 In other flower pot news, I'm so excited to have finally found a bust planter from Homegoods! He probably won't stay white for long. Want to see what my pals came up with? Use the links below to head over and visit them! How about you? Have YOU used Radiant Orchid for anything this year? i love your flower pots! love how you embellished them! and i feel the same way about this color- it was HARD. It wasn't hard for me Cassie ;) and Jennifer LOL. 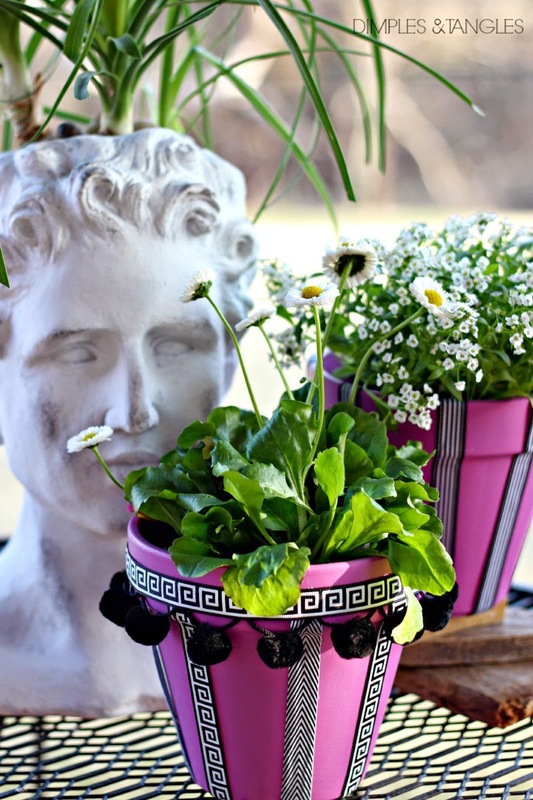 Love your flower pots and that Greek key trim is gorgeous. It is a hard color! But I totally agree we all need a shot of color in this dreary time of the year - flower pots are perfect. My daughters room has a ton is this color. Wait not a ton! The whole room!!! Your project came out so cute! 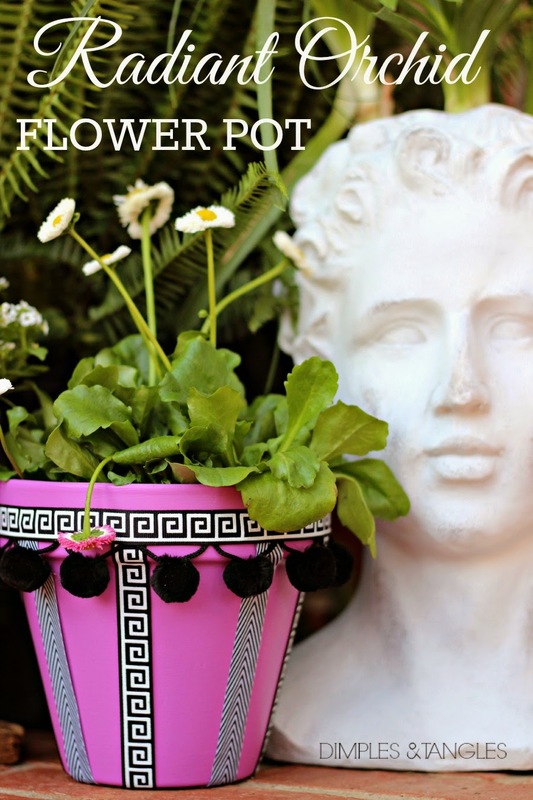 That flower pot is so you! 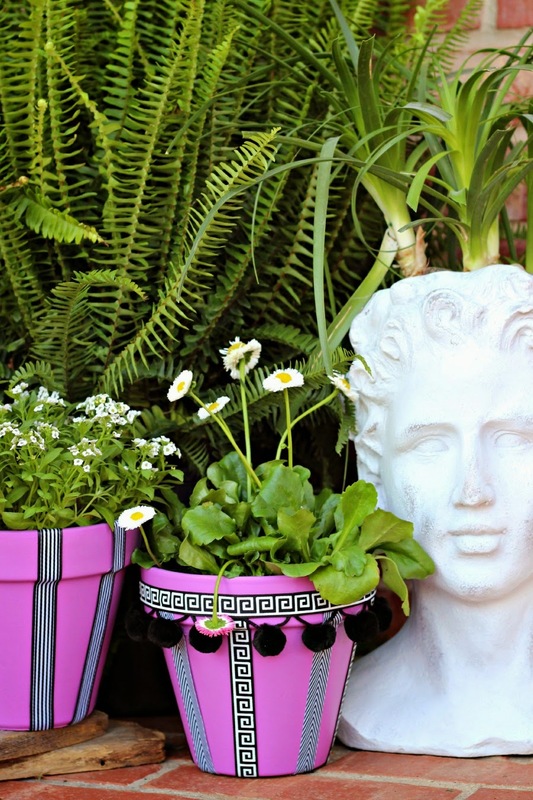 And I'm jealous of your new bust planter - can't wait to see what you decide to paint her! Darling! 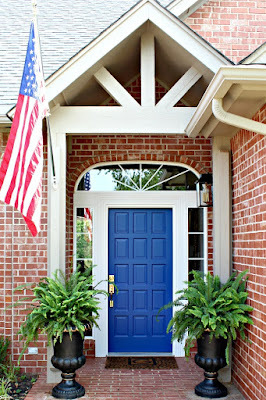 I am inspired to do a few of those for my sunroom... maybe in last year's color!!! 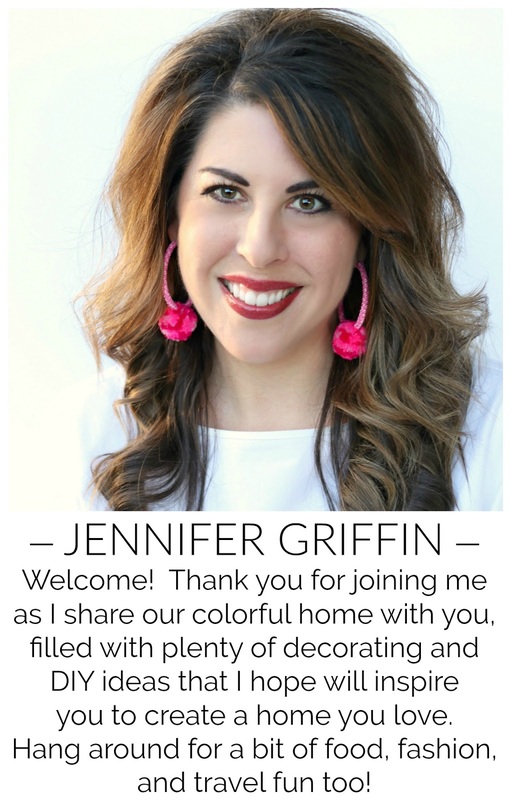 You are so creative - that is such a fun way to incorporate the color into your home! Perfect for spring isn't it? The black and white are great with the orchid. What a fun way to liven up the outdoors! What a cute idea!! The Greek Key looks great with the bright orchid! Love your cute addition of pom poms, everything is looking very springy over there! I love how you decorated them so cute! You did great Jennifer! It is a fun color for spring and the greek key ribbon is so you! Radiant orchid is really growing on me! I love how all of you have used it! I agree tough color!!! But you managed to make a project that's sooo you!!! Love the Greek key!!! so fun! I love the way you added the ribbon and pom poms! NELL HILL'S IN KANSAS CITY - HOME DECOR PARADISE! NOT ONE, BUT TWO EASTER TABLE SETTINGS! THE BEST LEMON SQUARES I'VE EVER HAD!